The Organizational Effectiveness Inventory (OEI) is your gateway to a deeper understanding of your organization’s culture and performance — gained through the perspectives of the people who live it every day. A partner to the Organizational Culture Inventory® (OCI®), the OEI provides valid, reliable, and usable “climate” data on the structures, systems, technologies, and skills/qualities that shape your culture — and how they can be modified and developed to improve long-term effectiveness at the individual, group, and organizational levels. their experience and perceptions of things that influence, and can be changed to improve, your organization’s culture and its performance. 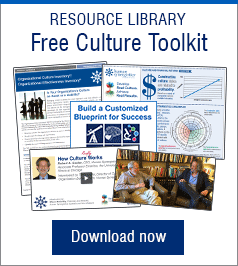 the outcomes of your culture for individuals (e.g., their engagement), groups (teamwork), and the organization as a whole (adaptability and overall quality of products/services). Members’ responses to the survey are aggregated and electronically analyzed to generate a report to support your organizational development or culture change initiative. When administered along with the culture survey, you are provided with a combined OCI/OEI feedback report that integrates the results of the two assessments. A Human Synergistics consultant or accredited practitioner then guides you through the findings and the steps required for successful change management. We recommend that you apply the OEI in tandem with the Organizational Culture Inventory, which focuses on behavioral norms and expectations, to get a comprehensive picture of the organization’s operating culture, current outcomes, and levers for changing culture and strengthening performance. The Life Styles Inventory™ and ACUMEN® Leadership WorkStyles™ 360 feedback assessments can be used as a follow-up when the OEI results indicate that improvements in leadership are needed. The OEI measures effectiveness at the individual, group and organizational levels and identifies the internal practices and conditions that lead to effectiveness both directly and indirectly via their impact on culture. An accredited and experienced Human Synergistics consultant can help you to use the OEI, identify relevant changes in systems and structures, and improve problem solving and performance. Simply contact us to team up with a consultant who’s right for your organization. You can ‘do it yourself’ by arranging OEI accreditation for one or more of your team. This will ensure they have the skills to administer the OEI, identify the changes needed, and help the organization to grow and develop. To get started, register for an accreditation workshop. If you would like to know more about the Organizational Effectiveness Inventory, or any of our wide range of assessments, please get in touch and we will be happy to assist you.